Alright, here we go... we are going to run the script. You should have already set up your secure TAILS environment, set up the Proxychains utility and figured out your parameters for your script and possibly have them stored on an encrypted USB drive. If you haven't gone through all that yet, you probably need to backtrack and make sure you are ready for this. This guide is specifically for using the proxychains utility to route your transaction broadcast traffic through Tor. 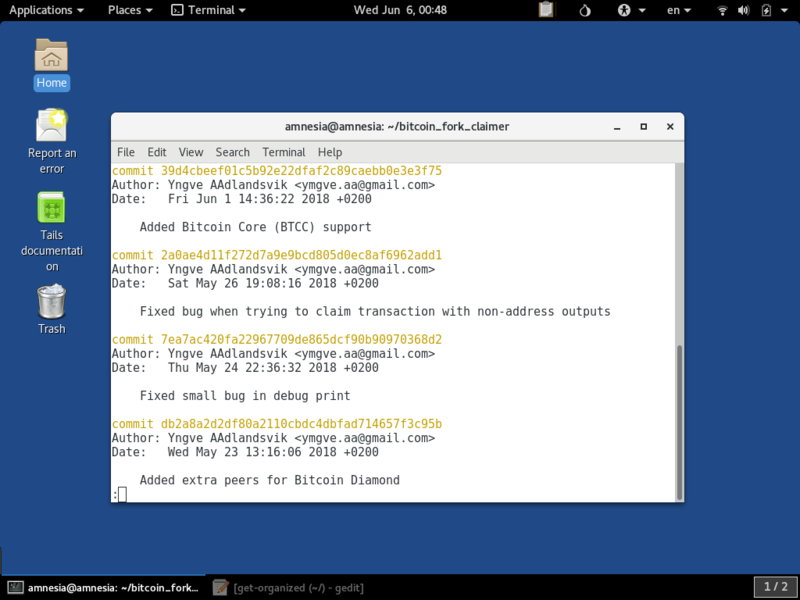 If you are interested in more generic Linux use of the bitcoin_fork_claimer tool, the Ubuntu guide is what you should follow instead. On TAILS, it has Python2.7 pre-installed. That is true for most other Linux systems. 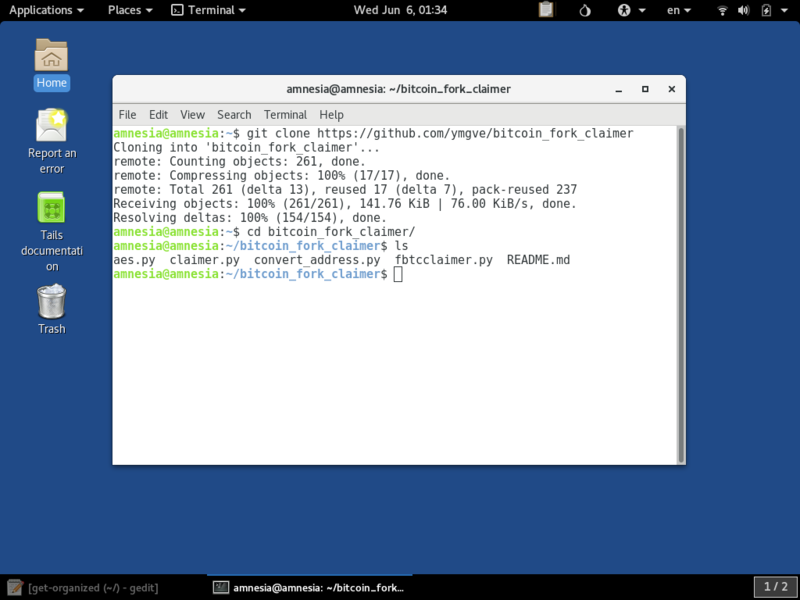 If you are using something other than TAILS, it is very likely that you already have a Python 2.7 environment ready to go, however we have an article to help you know for sure before you begin. 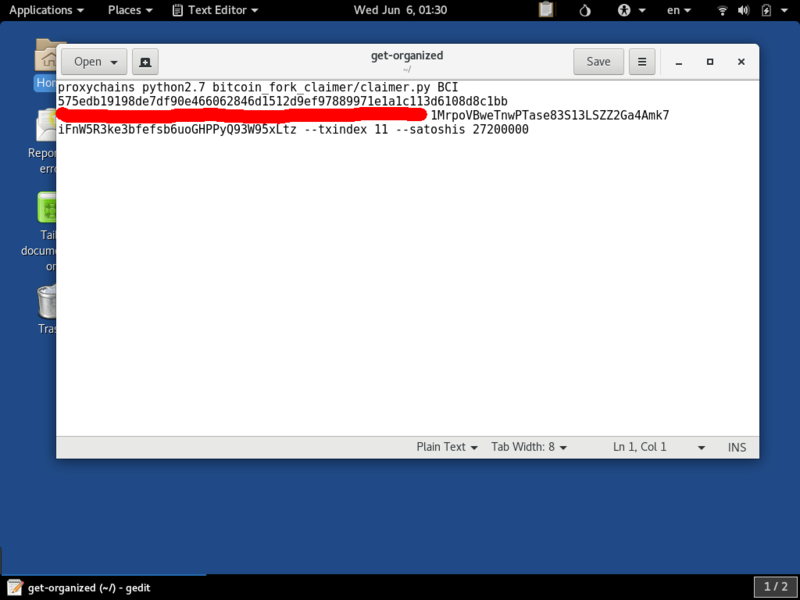 When finished looking at this the q key will exit the git log view. 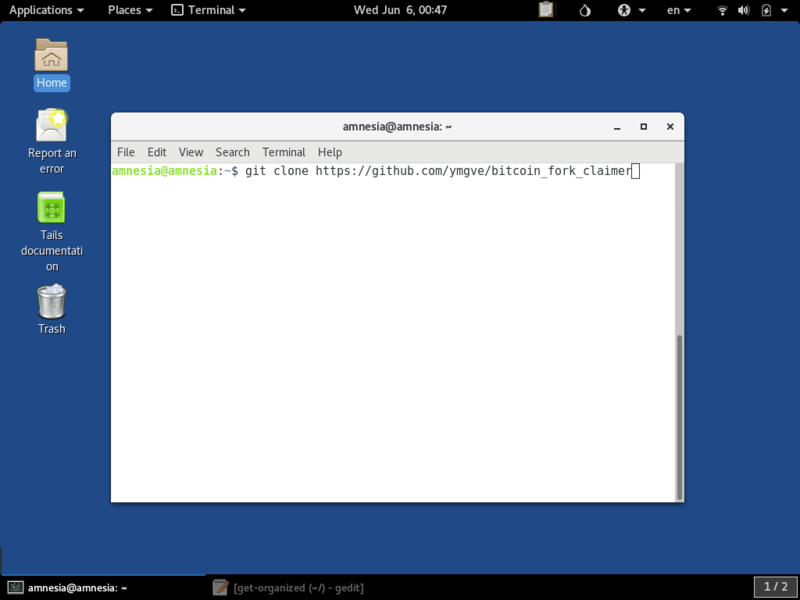 Then press Enter will get the terminal back to the user Home directory for running the command. 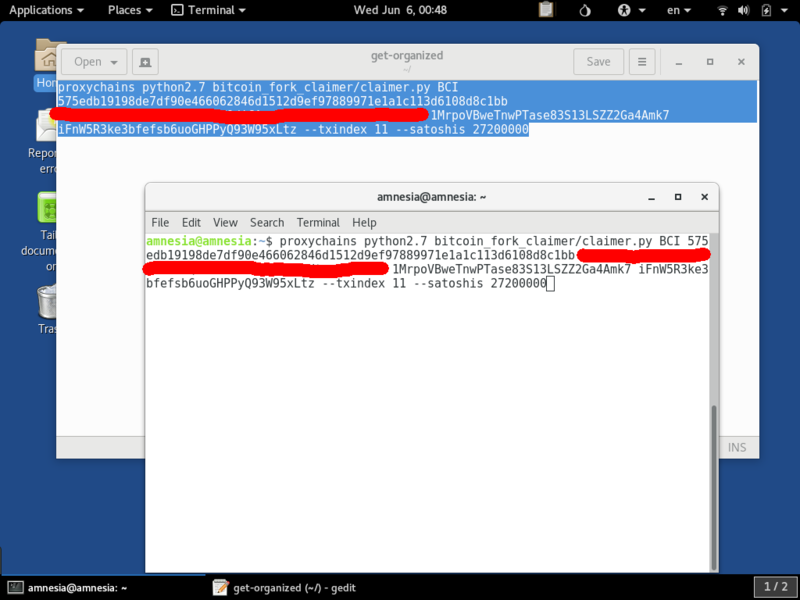 The lines should be made to start with proxychains, python2.7 and claimer.py as that is what is required to execute the script with the python2.7 environment. Now is also a very good time to double-check that your parameters match what the Tool's instructions say. The interpretation of this document was also covered in an article here. 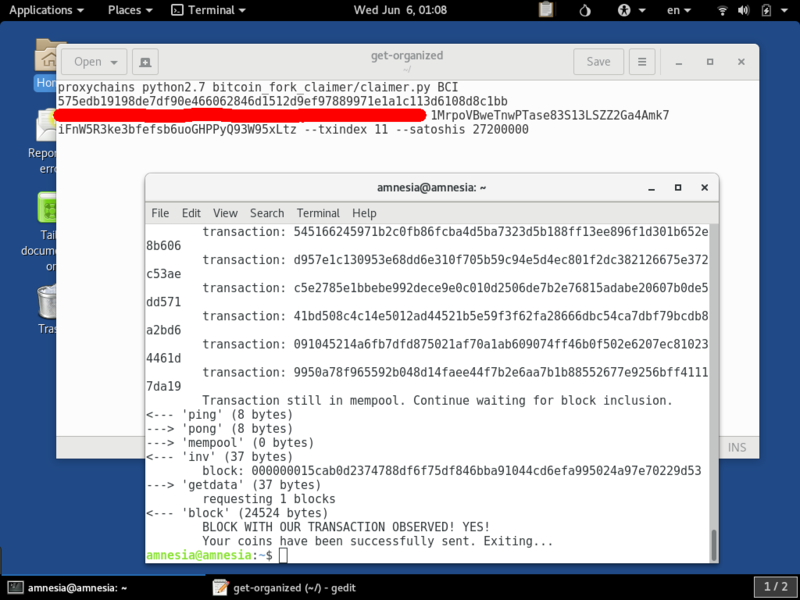 When you press Enter after typing the warning message, the transaction is created and broadcast to a node of the selected coin's network. 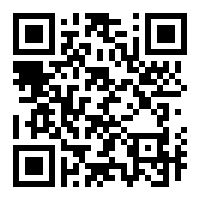 For some coins, this may take several minutes and many rounds of retries to be successful. This is expected, so be patient before concluding that something is wrong. The claimer.py script waits for 100 retries for a reason. Most exchanges require some number of confirmations, usually 6 or more, before they credit you with a balance that you can begin trading with. 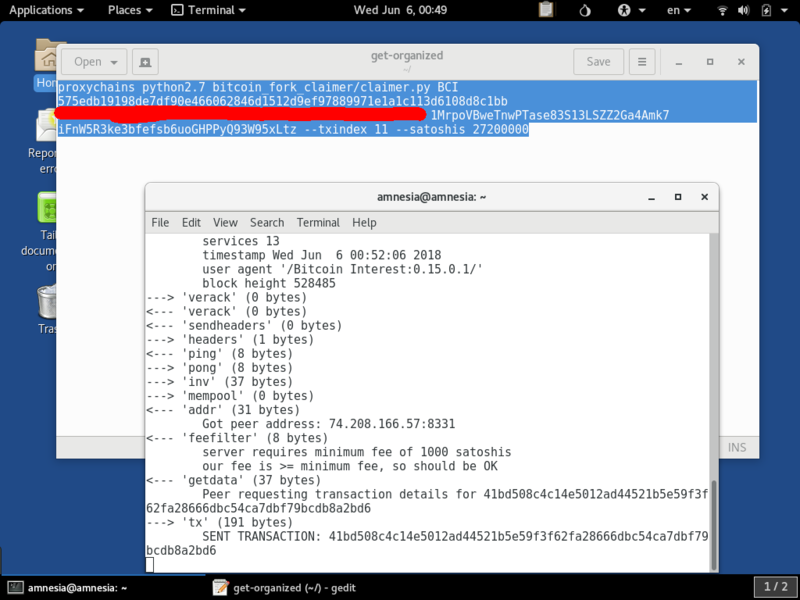 Also, since your transaction is on the network, you can use a block explorer which best done via Tor Browser (conveniently built into TAILS) to check up on the address you sent it to.